Well then. 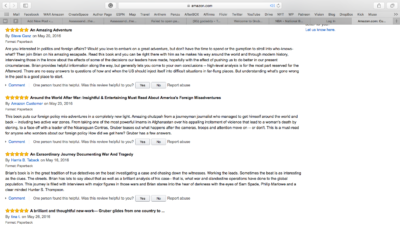 The purpose of “War: The Afterparty” is to write about things that matter. Specifically, the real outcomes of our interventions, whether we achieve our desired outcomes, and an assessment of the human and financials costs versus benefits of war. 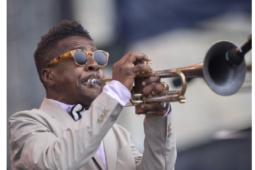 Now that the travel is done, I am planning the when, where, how (and why) of posting interviews and essays and social media, of how to use the Patreon platform, of how to deliver value for my Kickstarter backers. Thank you for coming along for the ride. Expect a lot of provocative, timely material, culminating in the publication and distribution of the book this year. 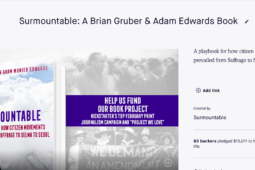 For those who read this after its initial distribution to Patreon patrons, you can support the project by pledging at www.patreon.com/briangruber. I didn’t cry at the ‘killing fields’ memorial on the outskirts of Phnom Penh, but I did at Prison S-21, now the Tuol Sleng Genocide Museum. 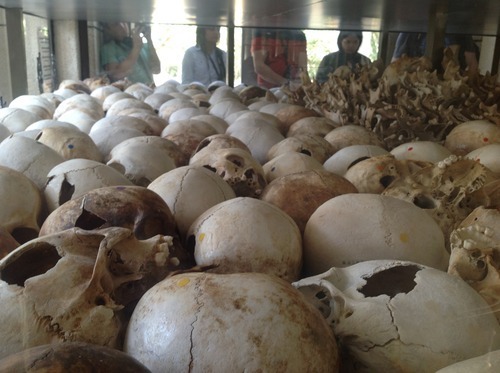 Perhaps because the villagers at the Choeung Ek memorial tore the place down, enraged, once the Khmer Rouge were in full flight, destroying the buildings, the torture spaces, the detritus of mass murder. I write this at the end of the “War: The Afterparty” world tour, having talked to the witnesses of a half century of U.S. military incursions. Most astonishing to me is how people want to move on, to forgive, to focus on the future. It’s fitting to end the trip here in Cambodia, the endgame of human cruelty. Because forgetting is not the antidote, lest the cycle of violence continue. A day after arriving in Cambodia, I watched the movie most widely associated with the genocide, “The Killing Fields,” with Sam Waterston, Haing Ngor, John Malkovich, Julian Sands and the late, great Spalding Gray. Phnom Penh has three guesthouse/ theatre/ cafes called Flicks 1, 2 and 3. The seats are the equivalent of couches, it’s very cozy, though I’m not sure the films are licensed. 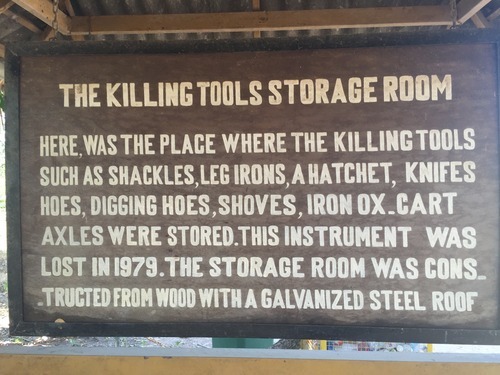 “The Killing Fields” plays once each day, without end. 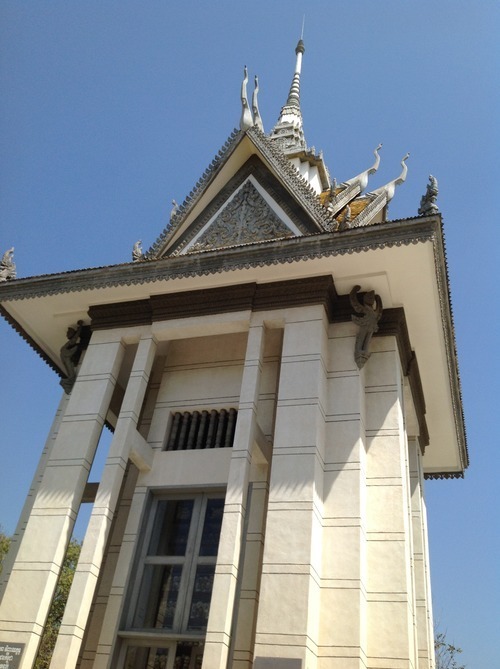 I liked Phnom Penh. A step or two behind highly developed Ho Chi Minh City, but a vibrant, historic city. The palace complex, where the great Khmer royals lived post-Angkor, was the most visually stunning highlight of the trip. The Khmer Rouge plotted Year Zero after their takeover in the sacred Silver Pagoda, camped out like schoolboys away on holiday. Pol Pot, the nom de guerre of Saloth Sar, Brother Number One, chose to sleep inside the pagoda in a makeshift bed, in an area usually reserved for statues of Buddha. The most chilling images to me were not the mass graves but the fierce look on the faces of the Khmer Rouge fighters. Young, uneducated country boys with no other personal prospects, gleefully murdering and tormenting strangers. True believers to a purist ideology, like the rural hillbillies of ISIS, only sporting differently-styled red kerchiefs. It’s hard to find interviews with witnesses of the four-year Khmer Rouge killing spree. So many are dead. The numbers are staggering and it is an obscenity to give ranges. 1.5 million, coulda been 3. From a quarter to a third of the country, dead. The most definitive estimates? 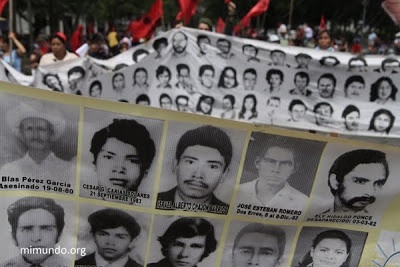 20,000 mass graves. Between 1.4 million and 2.2 million killed, half due to executions, the rest from starvation and disease. An additional 650,000 Cambodians starved to death in 1979 and 1980 due to the after effects of Khmer Rouge policy. At the Opera Cafe, a tony little bistro near my Phnom Penh hotel, I chatted up the waiter. 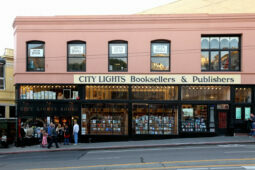 There was no else in the shop, a few patrons sitting outside. He was handsome, educated, thirtyish. 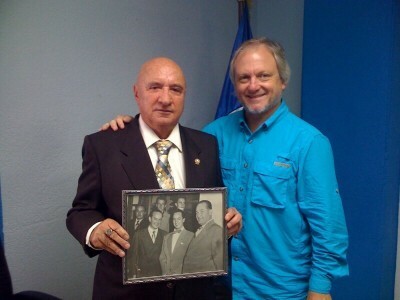 I had just visited the S-21 prison. He told me, well, the Khmer Rouge had both bad and good points. They fought the Vietnamese, after all. I had to restrain myself, besides being in the uncomfortable position of lecturing a Cambodian on his national nightmare. 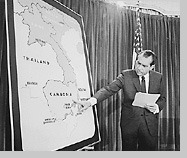 President Richard M. Nixon approved bombing sorties in Cambodia to disrupt North Vietnamese supply lines to South Vietnam. The Cambodian incursion was illegal, and secret for a while. The four students shot by Ohio National Guardsmen at Kent State University on May 4th, 1970, were walking to class or participating in demonstrations against the war in Cambodia. Late that year, Nixon expressed his dissatisfaction with the effect of B-52 raids.”They have got to go in there and I mean really go in,” he told National Security Advisor Henry Kissinger. “I want them to hit everything. I want them to use the big planes, the small planes, everything they can that will help out there, and let’s start giving them a little shock.” Operation Freedom Deal alone delivered a quarter million tons of bombs on Cambodia, eighty thousand tons released in the last month and a half of the campaign ending in August of 1973. Best academic estimates indicate that, in all, 2.7 million tons of bombs were dropped on Cambodia, in 230,000 sorties on 113,000 targets, resulting in between 50,000 and 150,000 civilian deaths. Opinions are mixed on the causal relationship between the bombing campaigns and the growth in support for the Khmer Rouge insurgency. In the end, blame for the killing spree lies firmly in the hands of Cambodia’s indigenous murderers. Next in line come Stalin and Mao, the KR’s primary ideological parents. But it’s clear that the country was destabilized by the Vietnam/ American war, and without those years of conflict, the chain of events leading to the KR takeover doesn’t happen. I walk past the prison and have to backtrack. Apple’s map app is mostly useless in Cambodia, and the signage is discrete. First moment of horror: the prison is a converted high school, consistent with the regime’s suspicion of bourgeois education. Schooling ended in Cambodia, renamed Kampuchea, the day the communists rolled into the capital. There are signposts explaining the prison’s history throughout. The cells are visible from the entrance. I buy my ticket, inexpensive but, as in Vietnam, significantly more expensive for foreigners, which I can accept. I don’t know why, but as I walk into the prison yard, I start weeping uncontrollably. I’m crying again as I write this. I’ll take a short break. The cells are tiny. They must be unimaginably hot much of the year. There are torture implements throughout. The school exercise facilities are repurposed to torture machines. If you survive the torture, you are trucked off to Choeung Ek, like cattle for slaughter. There is a sign over a pub on Monivong Boulevard visible from one of the cell blocks. I took a picture but was too disturbed to keep it, an invitation for tourists to come enjoy drink specials after their visit. Prison workers living on the boulevard reported that they heard the shrieks of tortured prisoners at night. 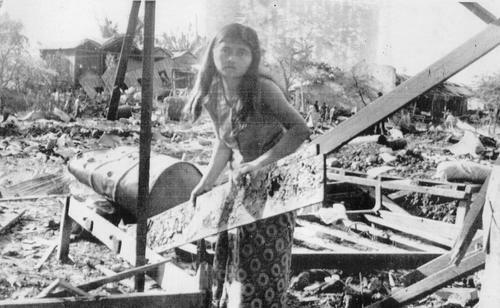 The Khmer Rouge were a relatively insignificant force of 20,000 in the sixties. As the violence of the Vietnam War spilled over the border, and the Ho Chi Minh Trail supplied southern forces through Laos and Cambodia, American B-52 bombers and special forces expanded the scope of the fight. Prince/ King-Father/ Prime Minister Norodom Sihanouk played a deadly game, condemning the bombing publicly while allowing American access privately Finally, in a state car on the way to Moscow airport, Alexei Kosygin turned to Sihanouk on the 18th of March, 1970, breaking the news that General Lon Nol and the National Assembly deposed him. After choosing to join forces with the Khmer Rouge with the hope of a return to power, the historic love of the Khmer people for their god-king kicked in, and the KR ranks swelled to 100,000. Those young farm boys had never heard of Das Kapital much less Josef Stalin or Mao Tse-Tung. 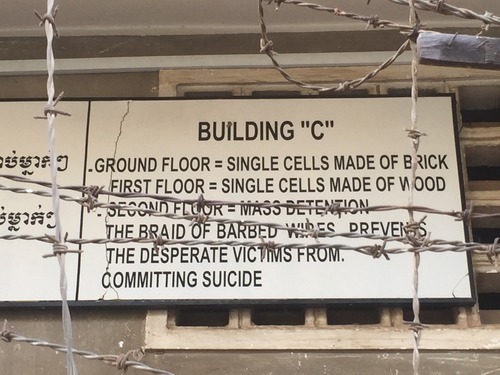 The S-21 cells come in three varieties, brick, wood or larger rooms, which were crammed wall-to-wall with prisoners. You arrived bewildered, accused of imaginary crimes. Much of the torture process is to get you to come up with something, anything, to stop the pain. And if you’re not convincing enough, more torture. Until your dearest hope is to be carted away to Choeung Ek, cattle awaiting slaughter. Then, there, some final indignity and torment, then brutal murder. 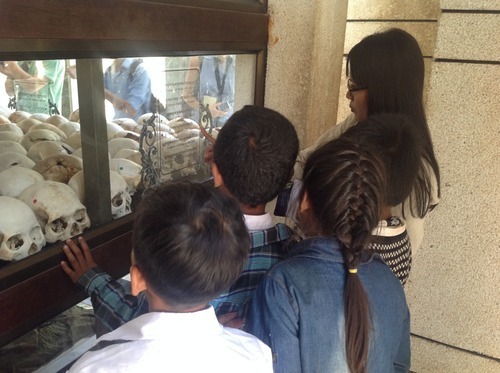 There were more than 150 Khmer Rouge execution centers. 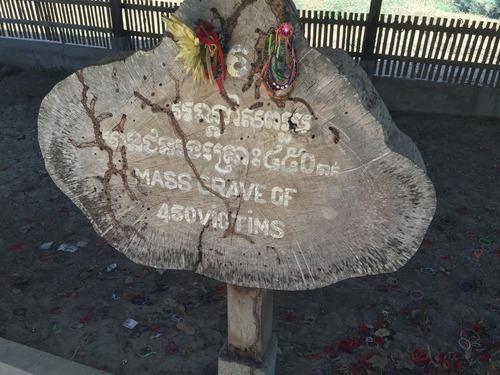 S-21 housed 1,000-1,500 at a time and an estimated 17-000 to 20,000 of its prisoners died, mostly at Choeung Ek. The site of the prison is Toul Sleng. The Phnom Penh Post described the etymology in its May 2, 1997 edition. According to the Khmer dictionary published by the Khmer Buddhist Institute in 1967, the word ‘Toul’ is a noun. It means the ground which is higher in level than that around it. The word ‘Sleng’ can be a noun and also an adjective. When the word ‘Sleng’ functions as an adjective, it means “supplying guilt” (del oye tos) or “bearing of guilt” (del noum oye mean tos) or “enemy of disease” (del chea sat-troy neng rok). As a noun, ‘Sleng’ means the two kinds of indigenous Khmer poisonous trees. The first kind is ‘Sleng Thom’ or ‘Big Sleng’ which have big trunks, leaves, and fruits. The second type is ‘Sleng Vine’ which is shaped almost like vine with small fruits. They are both poisonous. Therefore, from the above translation we can derive the definition that Toul Sleng literally means: a poisonous hill or a place on a mound to keep those who bear or supply guilt toward Angkar. Fortunately, as with the Taliban, the Khmer Rouge were so incompetent that their control of the country deteriorated. And, being the hopelessly over-confident and deluded morons that they were, they picked a fight with the more militarized, well-provisioned and seasoned Vietnamese Army. The current leader of Cambodia, Hun Sen, rode into Cambodia on a Vietnamese tank in 1979. He became head of state at 32, youngest in the world at the time, and, now, one of the world’s longest serving leaders. He is a former Khmer Rouge officer, serving as Eastern Region Battalion Commander. 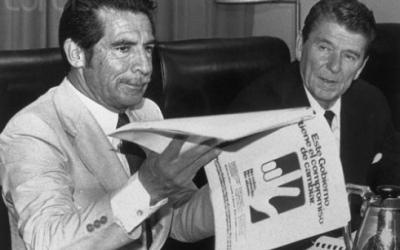 Still smarting from its humiliating departure from Saigon in 1975, the United States refused to recognize the Vietnamese-controlled Cambodian government in 1979. 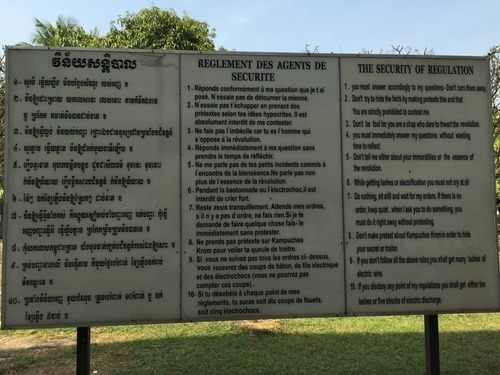 It recognized the Khmer Rouge as the only legitimate representative of the Cambodian people until a UN peace accord was signed over a decade later. I’ve been in Cambodia for three weeks. No one wants to talk about the past. I talk to young people and they claim limited knowledge of those years from their school days. Trials for the Khmer Rouge leaders have taken decades, resulting in the guilty verdicts of only two or three just last year. Pol Pot, the monster who devised the reinvention of Cambodian society, eliminating currency, schooling and most anyone with an education or knowledge of a foreign language, died shortly after hearing over Voice of America radio that his KR comrades were going to hand him over in April of 1998. His wife said he died in his sleep. Others are convinced it was suicide, or murder by the Ta Mok faction that was keeping him under house arrest in the jungle. His body was burned on a funeral pyre consisting of old tires and trash.